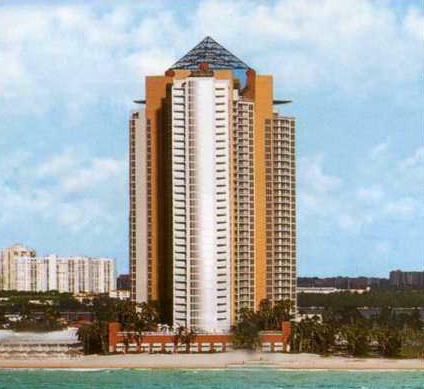 Ocean I, II, III and IV is a complex of luxurious waterfront condos in Sunny Isles Beach. The total number of residences is 990 and they were completed between 1999 and 2006. Every residence in an Ocean condominium enjoys views of the Atlantic Ocean, bay, and city views of Sunny Isles with resort style amenities. Ocean 3 offers fashionable, modern feel with a host of onsite amenities. There are several different configurations available among the units. The building is 32-stories high and features a lobby that towers three-stories of its own. The modern design carries on to the units, all of which feature views of either the Intercoastal Waterway or of the Atlantic Ocean. There are 300 feet of private oceanfront available to residents of this hotel, with beachfront cabanas being available, as well. Private security, on the job around the clock, controls access to the lush, landscaped property on which Ocean 3 is situated. Residents can have their cars parked for them by the valet service, and there is a covered parking facility with space for all of the residents. Those residents who like to get around in more active ways will find a place to store their bicycles at this facility, as well. There is also general storage space available to residents. A concierge service can provide residents with advice about the surrounding area, as well as a host of services. Each of the residences at Ocean Three have floor to ceiling windows. They also feature designs that wrap around the building, offering a variety of views. There are upscale finishes in the master baths, including marble flooring and frameless glass showers. The vanity tops in the rooms are granite. There are his and her master baths. The kitchens are of an Italian design and feature their own breakfast area. The countertops are stainless steel. There are washers and dryers provided in all of the units, as well. The powder rooms feature imported sinks. Each of these units is already provided with hookups for services including cable television and telephones, including multi-line systems.